The control of insect pests and other taxa may be a result of many factors that are difficult to separate and quantify. Introduced parasitoids, host plant resistance, pathogens and native predators led to the successful control of the spotted alfalfa aphid (SAA; Therioaphis maculata Monell) in California and elsewhere, although the relative contribution of each factor remained largely unknown. 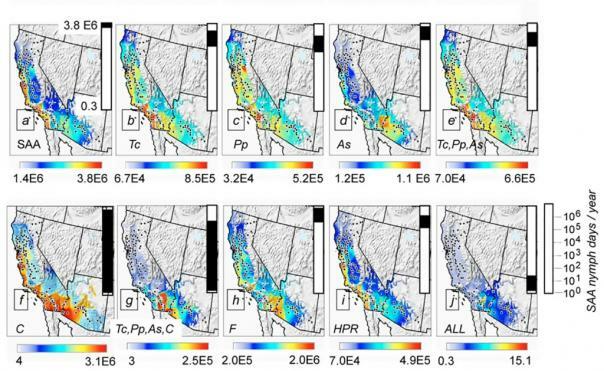 The relative contribution of each control factor was estimated using a weather-driven physiologically-based demographic system model consisting of alfalfa, SAA, its three exotic parasitoids [As; Aphelinus semiflavus Howard, Pp; Praon palitans Muesebeck and Tc; Trioxys complanatus (Quilis)], a native coccinellid beetle [C; Hippodamia convergens (Guérin-Menéville)], a fungal pathogen [F; Erynia neoaphidis Remaudière & Hennebert (Zygomycetes: Entomophthorales)] and host plant resistance (HPR). Daily weather data for the period 1995–2006 from 142 locations in Arizona and California were used to drive the model. 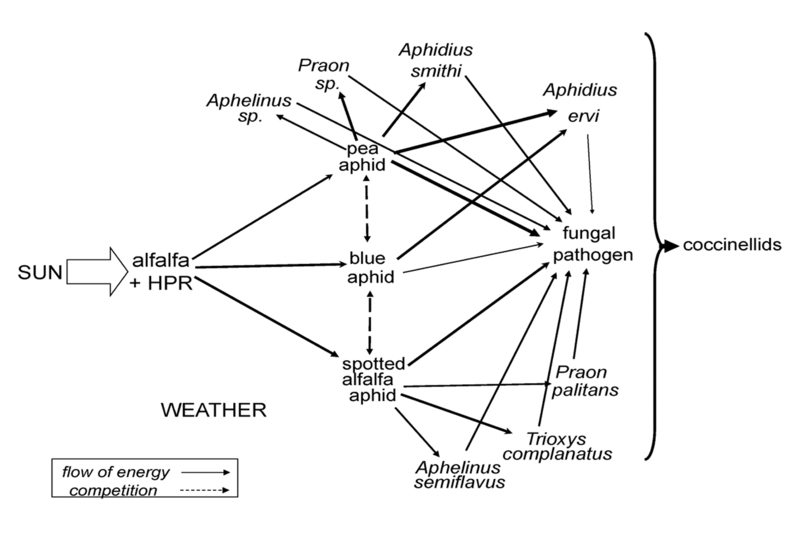 Energy flow in an alfalfa – aphid food web. The effects of host plant resistance is indicated as HPR. The factors were introduced to the model singly or in combination to assess their effects in suppressing simulated SAA populations using SAA-daysm−2 year−1 (i.e. density) as the metric of control. Data from selected runs were mapped using the geographic information system grass (http://grass.osgeo.org). The simulation data across all factor combinations, years and locations were summarized using linear multiple regression, with the dependent variable being log10 SAA-daysm−2 year−1 and the independent variables being the presence–absence (0, 1) of the various factors and their interactions. Marginal analysis of the regression model (∂y/∂xi ) enabled separation of the average effects of the different factors (xi) given the average effects of the other factors. Alone, each factor failed to control SAA, as did combinations of the parasitoids and coccinellid predation. Control was predicted across all ecological zones only when all mortality factors were included. The marginal analysis suggests that the order of importance of the mortality factors is HPR > coccinellid beetles > T. complanatus>P. palitans>A. semiflavus > the fungal pathogen. The variability of control by coccinellid beetles and the fungal pathogen was high and hence unreliable. Schreiber, S. and A. P. Gutierrez. 1998. A supply-demand perspective of species invasions and coexistence: applications to biological control. Ecol. Modelling 106: 27-45. Schreiber S.J. and Andrew Paul Gutierrez (1999). Insect Invasions and Community Assembly. In Ecological Entomology, Huffaker, C.B. and A. P. Gutierrez (editors). John Wiley and Sons. Gutierrez, A. P. and J. U. Baumgärtner. 1984. Multitrophic level models of predator-prey energetics: I. Age specific energetics models–pea aphid Acyrthosiphon pisum (Harris) (Homoptera: Aphididae) as an example. Can. Entomol. 116: 923-932. Gutierrez, A. P. and J. U. Baumgärtner. 1984. Multitrophic level models of predator-prey energetics: II. A realistic model of plant-herbivore- parasitoid-predator interactions. Can. Entomol. 116: 933-949. Gutierrez, A. P., J. U. Baumgärtner and C. G. Summers. 1984. Multitrophic level models of predator-prey energetics: III. A case study in an alfalfa ecosystem. Can. Entomol. 116: 950-963.